There was a moment in the third quarter of the Pistons' 102-90 loss to the depleted Brooklyn Nets that sticks out more than any of the more meaningful events of the game. Andre Drummond received the ball near the bucket and laid it in, as he's wont to do, drawing a foul in the process. He shrieked "And one" and generally looked angry. It was the first passion I've seen from a Pistons player all season and it dawned on me: this team doesn't like playing basketball. A general lack of on-court passion stands as an inherent problem in developing a program based on hard-nosed Goin' To Work players. Ben Wallace was known to be one of the most quiet players in the NBA. Chauncey Billups was the consummate Professional, a term loaded with safe, white suburban fan favorite sentiment. It wasn't until the Pistons acquired the outlandish Rasheed Wallace that they finally reach the pinnacle of the league. It wasn't Rasheed's attitude that won the Pistons a title, but his presence was a constant on that team. He wanted to beat everyone and make them realize it was happening. The Pistons played differently when 'Sheed was on the floor. This current Pistons iteration is lacking character. Josh Smith is outspoken, but his play fluctuates between high-energy impact plays and resting bitchface as he takes endless long jumpers. Greg Monroe's most prominent personality trait is complaining to the referees (a symptom that's infected far too much of the team). KCP and Kyle Singler might as well be cardboard cutouts. Only Brandon Jennings has any character and flair in his game, but that manifests itself as flashy passes, rather than anything a team can glom onto. Worse still, this team doesn't look like it enjoys playing together. Monroe has been a curmudgeon since Smith arrived last year, and it's likely that his lack of interest has spread to other corners of the locker room. Drummond appears too nice for his own good. 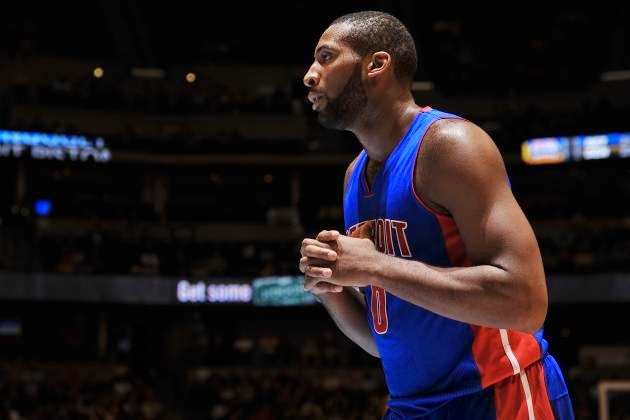 Though big men have a reputation for being gregarious, Drummond never looks interested in or motivated to take over a game. KCP has attempted to add some flair to the Pistons' offense this season and a passion for winning, but that generally ends in airballs and ill-advised shots. Once again, Jennings' character feels like the Pistons' rallying cry, but with SVG sitting the point guard for the majority of the first two games, the team has struggled behind the shoot-first mentality of DJ Augustin; if there's one thing you don't want with Smith and KCP on the roster it's a shoot-first mentality. All of which might be a roundabout way of saying that the Pistons don't have a go-to player on either end of the floor. KCP is the only individual defender that would be considered NBA caliber, but his struggles on the offensive end render him a problematic player to keep on the floor. On offense, Greg Monroe is the closest thing the Pistons have to a go-to guy, but he needs to be set up in the post, something he's never been exceptional at. And so you have a basketball team without an identity, regardless of the schemes SVG is trying to implement. The Pistons mope around the court without any idea how they're supposed to act. This is often the problem with young teams: one of the inexperienced players becomes the model for the team's persona. The Pistons don't have anyone with the kind of spirit that you hope will lead a team, and so it has gravitated toward the soft-spoken demeanor of its biggest star. Just once, I'd like to see someone during a game take accountability for how the team is playing. Much as Smith is maligned for taking too many (bad) shots, he's always being given the ball in these situations. It's not as if he's demanding the ball and then taking terrible shots. SVG is trying to force Drummond into this role, but that has resulted in the big man shooting the worst percentage of his career (48.5%) on the highest number of attempts in three seasons (11.0)--which says nothing about how poorly he plays on the defensive end. Andre Drummond is not going to be that guy. Perhaps if the Pistons were winning, this wouldn't be a problem. But they haven't been winning for years, and their leaders have been: Drummond (2014), Drummond/Stuckey (2013), Stuckey/Calderon/Monroe? (2012), Ben Gordon/Monroe? (2011), and the list goes on. The closest thing the Pistons have to an alpha player is Smith, whose performance is cratering potential wins and who has never been a team leader in the first place (a major emphasis behind him coming to Detroit). Jennings stands as the Pistons' only driver of character, but with a rift between he and SVG, his style likely won't have the impact on the roster that it should. The schemes and shooting will come around. The Pistons likely won't be a top-flight three-point shooting team, but they also won't finish the season shooting 21.9% from beyond the arc. But for this team to excel, they actually need to find an identity. Unless Drummond can continue to show some semblance of passion, it's unclear where that's going to come from.